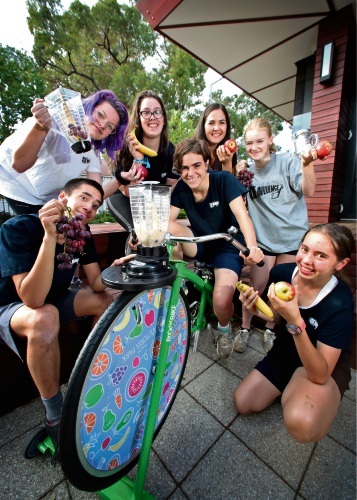 YOUNGSTERS will be able to peddle their way to a smoothie using a bicycle-powered blender as part of a huge line up of environment-themed celebrations in Kalamunda this month for WA Youth Week. The program kicks off with a T-shirt upcycling competition on April 16. The Tee with a Twist workshop will be guided by a local artist, to allow young people to use their creativity and imagination to repurpose T-shirts from their own wardrobes to help reduce landfill. A City of Kalamunda spokesperson said in Australia alone, 85 per cent of the textiles we buy are sent to landfill and we have become the second largest consumer of new textiles in the world after the US. The repurposed tees will be displayed at the Kalamunda Night Markets on Friday, April 20, where the public can vote for their favourite design. This will coincide with an eco-festival at the markets with eco-friendly giveaways, a recycle right station with simple waste reduction ideas and the chance to peddle your way to a smoothie using the bicycle-powered blender. A pop-up cinema will finish up the evening with a screening of Wall-E.
Mayor John Giardina said Youth Week was all about celebrating and supporting young people and their contribution to our community. “In our 2017-2022 Youth Plan consultation, young people told us that the environment was a key area they felt passionate about so our Youth Week program has been tailored to meet this interest,” he said. WA Youth Week runs for April 13 to 22.